Organic Vanilla Extract made with Organic Madagascar Beans. 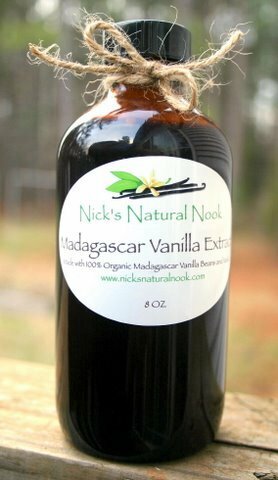 From our sister company, Nick's Natural Nook, we make this vanilla extract in our home. Our vanilla is well-aged and 100% pure with no additives and never watered down. You will not find any unhealthy corn syrup, or any other additives for that matter, in our vanilla. Check labels - most vanilla sold in stores is either watered down or has corn syrup or coloring added. Pure extract is hard to find! This must be why our vanilla has travelled the globe. You will find our vanilla strong and dark. We love vanilla and use it liberally in recipes, but typically you would use the amount called for in a recipe, or more if you like. Organic Vanilla Extract 8 oz.